More than half of contact center leaders plan to enable Internet of Things and artificial intelligence in the next year. More than half of contact center leaders plan to enable Internet of Things (IoT) and artificial intelligence (AI) in the next year, signaling a shift toward accelerated innovation in the contact center, according to research from the International Customer Management Institute (ICMI). Research of more than 350 executives and managers conducted by ICMI and Oracle finds that 57 percent of respondents say their organizations intend to support IoT/connected technologies within the next six to 12 months, in a 21 percent jump from today. And while only 35 percent of organizations currently use AI, 85 percent of respondents would like to see their companies expand its use or adopt it. “Companies now have to provide a level of service based on what customers want and not just what the companies themselves want to provide,” says Justin Robbins, ICMI’s group director of content and community. So what does this mean for customers? Think shorter wait times and more efficient service as automated and self-service solutions solve routine problems, freeing associates to focus on more complicated issues. Contact centers, for instance could use AI to collect and analyze data from connected devices to better address customer needs. If a customer calls about an issue with his or her smart fridge, the associate can look up data from the fridge itself to better identify the problem. Taking it a step further, maybe the fridge is programmed to automatically order a replacement part and make a note on the customer’s CRM record for reference in future contact center interactions. As more automated systems handle routine requests, however, associates will need additional training. The research found that 67 percent of respondents say their contact centers trained associates to handle customer interactions differently due to supporting IoT/connected technologies. And 23 percent of contact centers hired for a different associate skillset to supporting IoT technologies. If the company is planning to offer trouble-shooting support for connected devices, give associates an opportunity to use the devices themselves or set up a test lab so that they can experiment with the technology and understand it. IoT is bringing more channels and devices together than ever before. Contact centers should therefore “think of connected devices as additional customers that are bringing you a lot of information,” Robbins says. “Especially if the devices are programmed to submit requests themselves, the contact center must be able to process all that data, otherwise your customers will be unsatisfied.” To do so, companies should assess the capabilities of their CRM system and other data management platforms, Robbins adds. 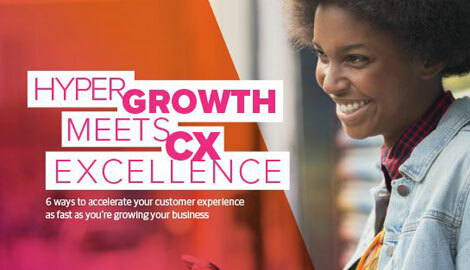 Companies can no longer afford to get by with subpar customer experiences. Digital improvements in the contact center are crucial if organizations use them to meet customer needs today and in years to come.